Hummingbirds are any of the species of birds belonging to the taxonomic family Trochilidae. They are best known for being the smallest birds, and the only birds that can hover and fly backwards. Its common name comes from the hum its wings make as they flap 12 to 90 times per second as it hovers in mid-air. 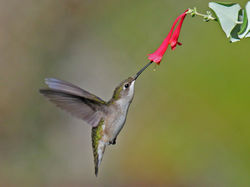 Hummingbirds are measure from 2.8 to 3.5 inches, and weigh .7 to .8 ounces. 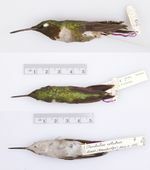 The plumage (the feathers of a bird that make up their distinctive markings or coloration patterns) of hummingbirds is iridescent and unique; brightly colored The throat gorget the male hummingbirds is a key field mark in shape and color. The picture of Perijá metaltail below shows its unique, iridescent, green gorget. Hummingbirds have a short life span with many not surviving their first year and most dying within three to four years of their birth. 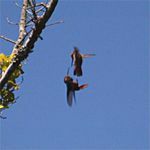 The reproduction process begins with the hummingbirds' return to their breeding grounds usually beginning in late March. The male birds return to the breeding grounds about a week before the females. The male birds put on air shows to attract female birds as they arrive, going as high as 49 feet before going into top-speed dives and patterns in the air. The female picks her mate from among those putting on the displays. The male hummingbird may mate with several females. The female bird weaves her cup-shaped nest with no help from the male bird. The nest, as shown in the picture on the left, is most often built in the branches of tress or shrubs camouflaged with bits of moss. The finished nest is about the size of a ping-pong ball. 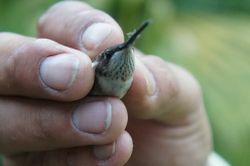 The female hummingbird lays two white eggs about the size of peas, which are the smallest eggs laid by any bird. Occasionally, a female bird will lay only one egg but rarely does she lay more than two. She sits on her eggs from 18 to 19 days, leaving for only about five minutes every hour. When the babies hatch from their eggs, their mother feeds them by gathering nectar and insects. By the eighth day of life, the babies begin to produce their first feathers. After about three weeks, they leave the nest and completely take care for themselves. The most unusual behavior of a hummingbird is its flight. As mentioned in the introduction, hummingbirds are the only types of birds that can hover for a long period, change directions almost instantly, and fly backwards. This acrobatic behavior is possible due to the unique design of the wings and joints. ↑ 3.0 3.1 3.2 3.3 3.4 Mayntz, Melissa What Is a Hummingbird? About. Web. updated December 28, 2014. This page was last modified on 8 December 2016, at 12:53.